You'll find there are some 47 Spanish airports - and, with its thriving tourist industry, the country certainly needs them. Madrid's Barajas Airport is the busiest, followed by Barcelona, Palma, and M laga. 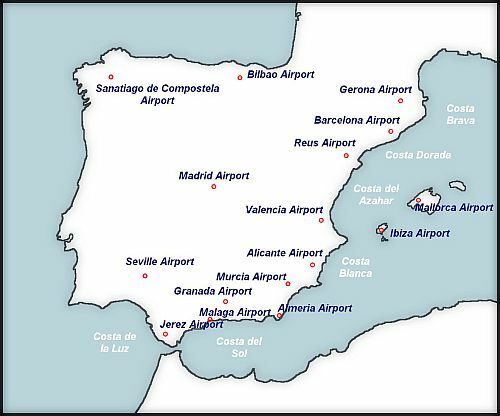 Scroll below to discover a map of Spanish airports, links leading to details about individual airports, plus the best in search possibilities to help you unearth top deals in flights to Spain . Of recent years, it's also been possible to find really affordable car rental deals in Spain. However, you do need to be careful, as the Spanish authorities imposed fines against several Spanish car rental companies. Whether your destination choice be beach, city, or countryside, hiring a car in Spain can be an excellent idea ... prices are really good, you can go just where you want, and it can solve the problem of how to get from the airport to your accommodation. Having said that, you do have to watch carefully which car rental company you choose ... Not so long ago, huge fines were imposed on several well-known suppliers, such as Goldcar, Avis, and Centauro, by the Spanish National Competitions Commission, for both fixing prices and also charging over-the-top for such extras as kiddies' car seats. For this reason, we recommend Blue Valley Car Hire, where you can not only search for the best deals for low cost car and minibus hire in Spain, but also check out their articles on what's going on in Spain and the car rental sector. This map shows the location of the major international airports of Spain. Want to find the best deals going in flights to Spain? Well, whether you're after Economy, Business, or First Class flights, the following search engine will come up with your top choices. You'll be able to search over 600 airline companies worldwide to unearth the cheapest flights for you. What's more, it's simple and easy to use, and you can alter language and currency to suit your requirements. Return from airports in spain to top tour of spain home page. Learn Spanish vocabulary and grammar fast with this novel method. Includes downloadable mp3s and Spanish flash cards. Get to grips with those pesky Spanish verbs using this Simple, 7-Step System. Includes downloadable Spanish flash cards. Choose your dream Spanish baby name with this book which lists thousands of Spanish names and meanings, plus Basque and Catalan names.